Did you know that Mother's Day was founded as a protest to war and violence? This is the powerful original proclamation made by Julia Ward Howe in 1870. Sometimes when I look around at the weird commercial venture that the holiday has become, it just makes me shake my head. But we're a business and the day is still a great one to honor those marvelous mothers of ours. And it's true that we've got some great things around for the mothers in your life if you're looking for a gift. 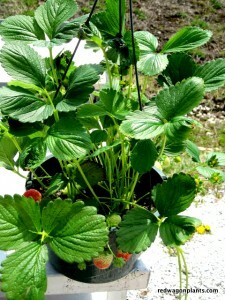 We've still got these amazing ever-bearing strawberries in hanging baskets. A few are just dripping with ripe berries even. And the flowering baskets really are just breathtaking. We've got a ton of beautiful things for you to give, or for your own enjoyment of your garden and food. Hope we'll see you this weekend, and we invite you and your families to join in honoring the original intent of this day by going to the Peace & Justice Center's Mothers for Peace Celebration in Burlington.